This micaceous clay is found way up deeply rutted 4 wheel drive roads in a humble pit, overlooking the Sangre de Cristo mountains in Northern New Mexico. It is hand dug with shovels and picks after a corn blessing to the 4 Directions. Mother Earth is also honored, as my teacher Brian says, by asking “anyone with testicles to please remove their shoes.” The boys tread delicately. Picks are used to break up the tightly packed hard clay dirt (with schist and sand) which is shoveled into the back of the pickup. Then the dig site is tidied up, so that no loose clay dirt remains. Back at Filipe’s, the clay dirt is wet in a cement mixer and then poured through a plastic window screen into a 2″ x 6″ wood frame lined with a bed sheet. Mixing clay at Filipe's. Mountains in the distance are where we dig micaceous clay. The clay is allowed to settle and the water evaporate and flow through the weave of the sheet. Occassionally, the clay is stirred to evenly distribute the settling layers of a soft, thickening mixture. Reminds me of the awe and amazement of my first mudpie. Rich, smooth and creamy! 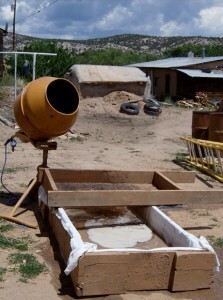 Then when the clay begins to stiffen (from loss of moisture), it is pulled up from the sheet and piled in the middle. The clay mountain is punched into, pulled out and piled onto, mostly redistributing the parts of the mucky mass and then spreading it all out flat and smooth again to dry. Meanwhile, mica sparkles everywhere. When the clay can be easily rolled into a coil and not stick, it’s ready to be chunked into 50 pound bags. And lots of happy clay pot makers!